Since 1882, horse-drawn cars were utilized as public transportation within and between the Village of Bellevue and the Village of Niagara Falls. 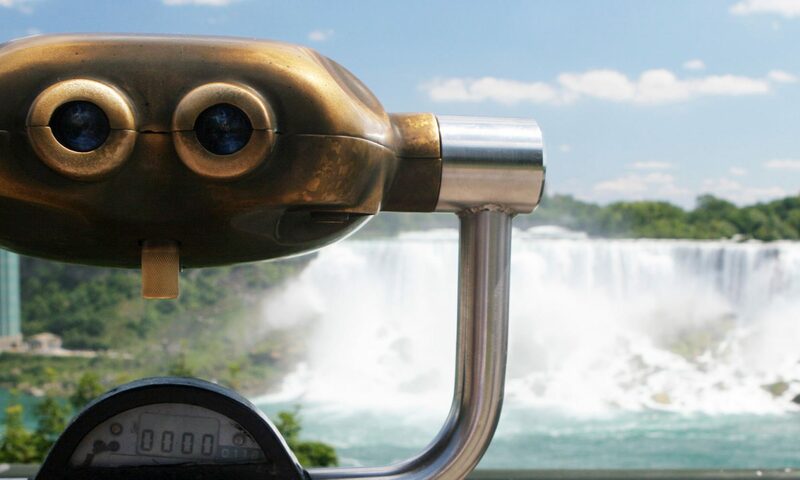 On March 17th 1892, the Villages of Bellevue and Niagara Falls merged and became the City of Niagara Falls. In July of 1892, the horse-drawn cars began to be replaced by electric trolley cars. On July 15th 1892, the first run of an electric trolley car occurred along the entire length of Main Street. The new electric cars were capable of carrying forty people at a time and a maximum speed of 20 mph. Soon the trolley lines were extended to serve Buffalo Avenue to the Village of LaSalle and included lines along Sugar Street (Hyde Park Boulevard), Ontario Street, Highland Street, Pine Street, 19th Street and Niagara Street. Then in 1894, the Niagara Falls, Whirlpool and Northern Railroad opened a single track rail line northward to Devil’s Hole. Both the railroad and the electric trolley service merged and became known as the International Railway Company. The Devil’s Hole rail line was extended to serve Niagara University and Riverdale Cemetery. On June 6th 1925, the trolley service to Sugar Street (later known as Hyde Park Boulevard) was terminated. Motor vehicles, buses, better roads and bridges were catalysts for the end of the trolley era. On Sunday August 22nd 1937, the last trolley streetcar in Niagara Falls made its way along Niagara Street to the Riverway Trolley Terminal. In 1895, the first inter-city trolley line between the City of Niagara Falls and the City of Buffalo was built by William Ely, the president of the Buffalo and Niagara Falls Electric Railway. Service along this electric railway line began in 1895. A trip between Niagara Falls and Buffalo took nearly two hours to complete. The line followed a route through Tonawanda, New York. The railcars traveled up to 30 mph and a round trip fare cost 50 cents while a one-way fare cost 35 cents. On June 11th 1922, the last inter-city electric trolley ran between Niagara Falls and Buffalo. It had been replaced by a much more efficient “high speed” electric railway. In 1918, a high speed electric rail line was built between the City of Niagara Falls and the City of Buffalo. The cost of building this railway exceeded $4 million dollars. Outside of each city the bright yellow trolley followed a railway where it could reach a maximum speed of 60 mph. A fare from Niagara Falls to Buffalo cost 60 cents and local passengers only allowed access to the new rail line at the main terminals. In 1935, the opening of the Grand Island Bridges led to the end of this electric railway as motor cars and buses made the journey much more convenient and comfortable. On August 20th 1937, the last high speed electric railway car traveled between Niagara Falls and Buffalo. Both inter-city services were owned and operated the International Railway Company.